My late great grandmother Ruth lived through the great depression along side her parents and 13 brothers and sisters. There was a time that they all lived in tent houses. I sat on her lap and listened to the same stories countless times, never tiring from hearing them. How her family once lived on mainly potatoes and had to walk, as young children, in the snow to get them, dropping a few along the way back due to the heavy weight. 60 years later and she still hated the fact that she had to toss out some potatoes to relieve the weight on her tiny shoulders to get what was left of their dinner home. Some people may be laughing right now. It sounds overly dramatic. Most of us are detached and unfamiliar with the face of poverty and suffering in a fast food generation where everything is readily available to us. Of course there are thousands of Americans going hungry right in our backyard and it’s not that we are heartless, it just doesn’t register. Besides, “you can’t save the world” right? Turn on the news or pick up a paper, a lifetime of receiving bad news and one becomes desensitized. If everyone felt that they could save the world, it would be so different. I am raising my kids to be eco-conscious. To value our natural resources because they provide solutions to our needs. I get butterflies when I am driving in town and pass a front-yard garden. People taking responsibility for their livelihood and their future; not dependant completely on the government or their job. When great grandmother Ruth was no longer an impoverished child but now my “big grandma” and owned her own home and had a savings account, it was deeply engrained in her to save;, to grow;, to prepare; to conserve. No longer out of neccessity but because it simply made sense. Waste was not tolerated in her home. She bought all of her clothing and goods at a local thrift store where everyone knew her name. She often let me pick out a plastic bag full of small toys and stapled together with a price tage of .50 cents. I remember feeling the same delight for that bag of used toys as I did when my mom spent 300 times the price on a new version, but still felt that I had to have new things. Big Grandma also purchased clothes for me there. I always accepted graciously but at the time wasn’t familiar with the concept of “reuse,reduce,recycle” that my kids now sing at the top of their longs with Jack Johnson. 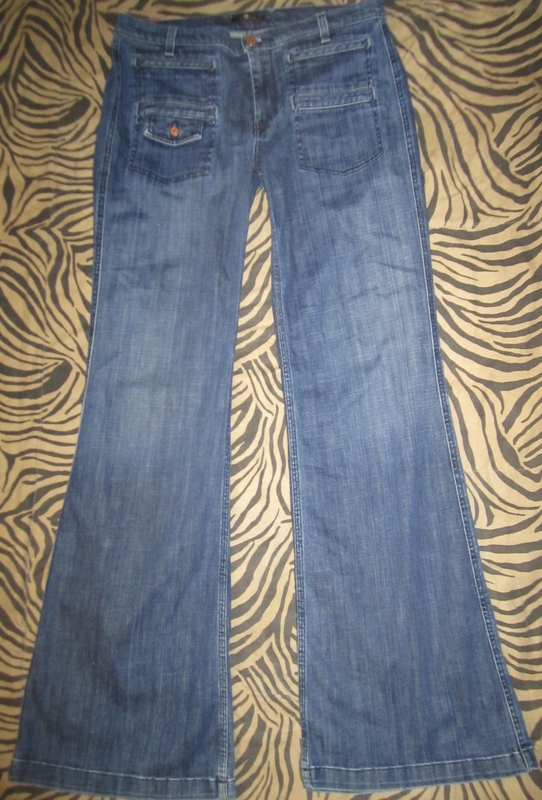 In fact I was mortified at the idea that my clothes came from the thrift store! I would never allow my dear grandmother to get an inkling of how I felt but on the way to school I would anxiously ask my mom “What if someone says “I like your shirt, where did you get it?” What do I say mom?” Mos reply “You say, thank you, I don’t know, my grandmother got it for me”. So, I knew drill. I felt it was something worthy to be hidden, but I have chaned a lot since then. I think it’s silly today. I am proud of my thrift store finds, as you can see I have dedicated an entire page for you to be inspired and of course to brag. I love treasure hunting, it’s in my blood. I just didn’t know it at that age. 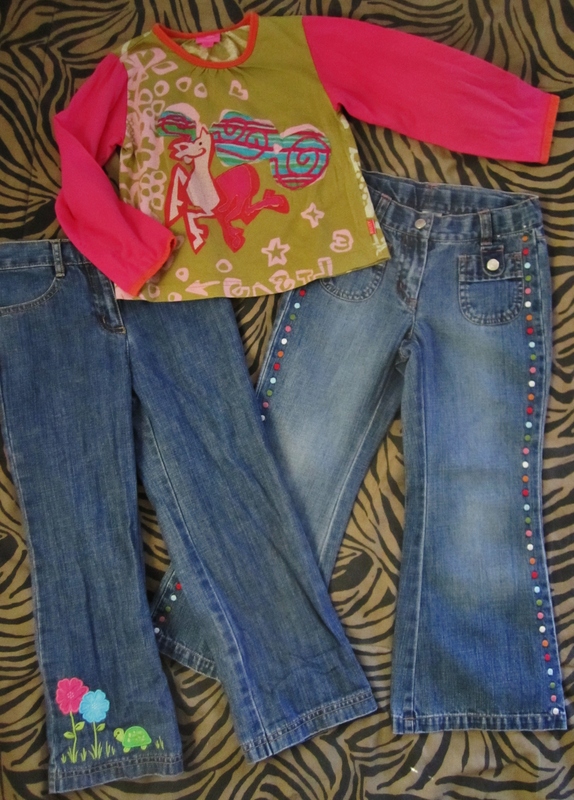 The age that my kids are today, and I am proud that they have no shame in their thrift store/yard sale/ebay salvaged clothes. On a grand scale my oldest (9) understands the impact waste makes on our enviornment. He learns about it at school and at home. He, like other children love to feel purposeful. To be “mommy’s little helper”. If you give your kids the opportunity to help, to save, their chests will puff up, ready for the job! On a smaller scale, my son understands that the more we conserve and utilize our natural resources, the more comfortable and satisfied we will be. We enjoy an abudant life on very little. We eat well, we dress well, we live well. And with no need to go to the mall. We try to buy local and support our farmers. I say try because we are a work in progress and always open to learning new ways of creatively conserving. I recently discovered www.naturemoms.com who provides a wealth of information. You can read about eco art supplies or anti-commercialism. You can shop for BPA free sippy cups and scan their Green Products Directory. Compiling your own green directory is a great idea. I have done this and continue to add to mine the eco-savvy companies that fit our needs. We need to stay informed on the alternative products that are naturally sourced, chemical free, upcycled, eco-friendly. Big brands are beginning to gain an understanding that they will need to change the way the mass produce to stay current in the way the world is turning. Still, there is so much more that can be done. GREEN = LIFE. LIFE= HEALTH. Make healthy decisions for your family and be an eco-savvy consumer! Please give me your feedback. What do you do in your household to conserve, recycle, or save money? How do you teach your kids the importance of being green? I love hearing from you! 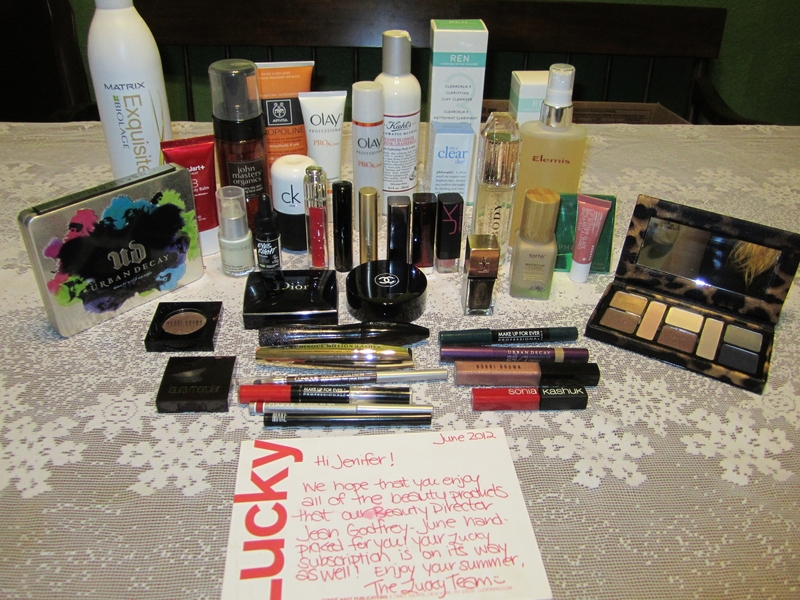 I was literally like a kid counting down the days until Christmas waiting for my beauty gift from Lucky Magazine!! All the beauty products hand-selected by their Beauty Director Jean Godfrey!! What would she choose? The woman who, I imagine, has the most luxurious and highly sought after products from all over the world, sent to her daily! I am sure she has high expectations; It’s her opinion that decides the best in beauty. Due to previous problems with my mail carrier service I opted to have my gift sent to my grandparents to ensure it would get to me safely. I tried calling the Black Ops to inform them of the special mission, but couldn’t get a hold of them so I was left to depend on UPS alone. So, to grandmother’s house it goes! I have never been big on scented or perfumed lotions. You know during the holidays all the fragrance counters come out with the Value Sets that almost always include body lotion infused with your favorite perfume? Well, that gets thrown in the junk drawer, until a year later when I have the heart to give it away. My skin is sensitive and in the summer months I am especially hesitant to try scented lotion because it usually irritates. This lotion was given to me from Lucky Magazine’s Beauty Team and so I had to test it. I am pleasantly surprised! It’s a deliciously citrus-clean, feminine scent that is noticeable but not over-powering. I can really smell the grapefruit as well as the floral notes. The best part though, is that it doesn’t irritate my skin! Not even in these hot summer months! I apply it all over after I get out of the shower and I get hints of this fresh scent throughout a full work day, which has been lovely. I am pleased with this lotion and I feel good wearing it because it’s sustainably sourced from all natural ingredients! I really want to try the Vanilla & Cedarwood! 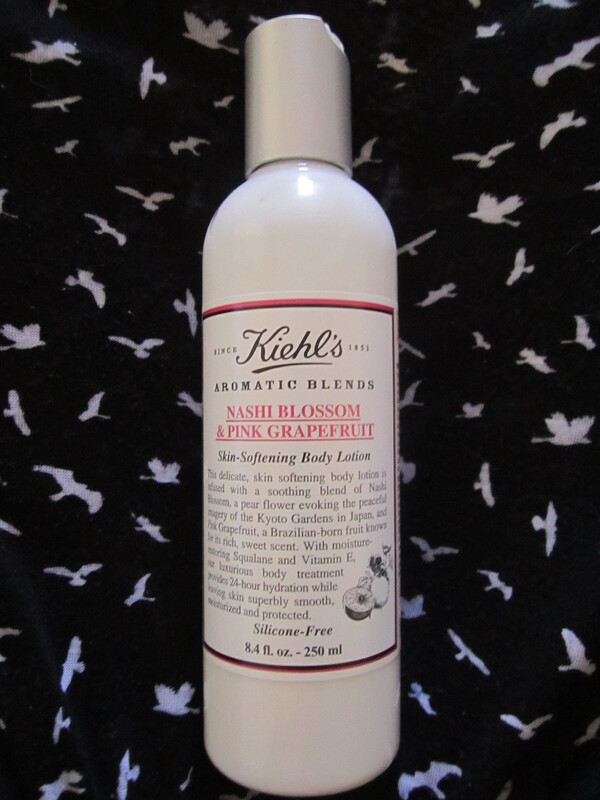 If anyone has tried any of the Kiehl’s Aromatic Blends, please share your opinion! I’d love to hear your feedback. I also scored abunch of shirts for my son for back to school. All were a dollar each and included Tap Out, Hurley, Metal Melisha, and NFL gear. He was super exited because usually I find girl stuff galore for his sisters but boy stuff is harder to find. 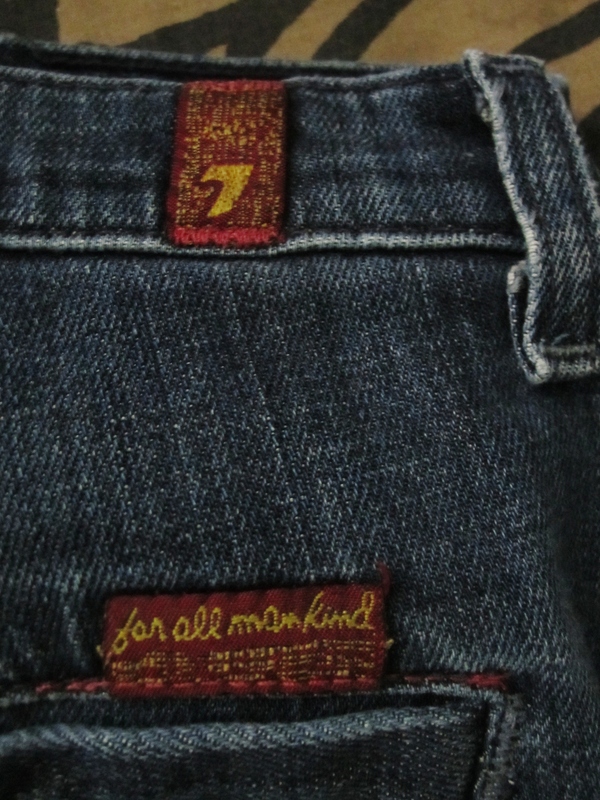 The purpose of this post is nor only to brag about my fabulous deals but to shed a spotlight on Salvation Army who I love and support, and challenge everyone who reads this to resist consumerism, keep fab designers and brands out of landfills and to save YOU money so you can do more with it. slice okra in 1/2-1 inch pieces. 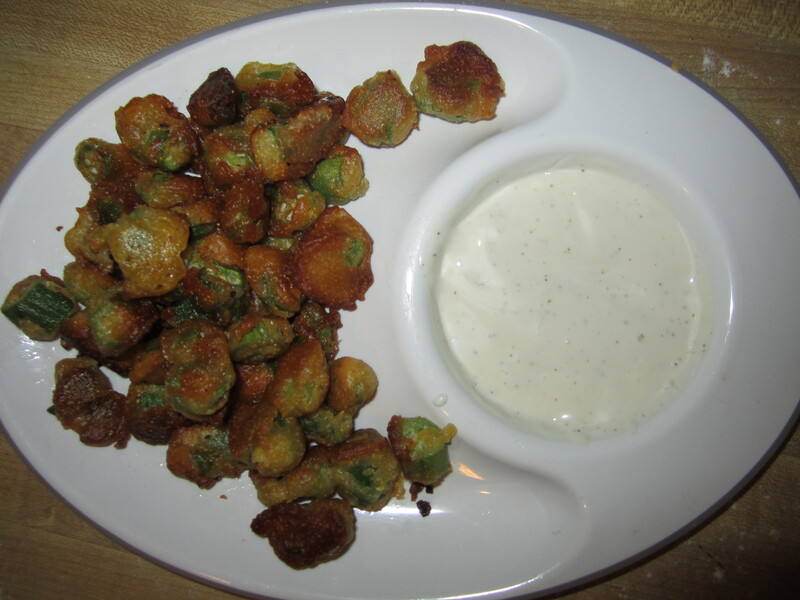 Stir and dip in batter. Fry in 1/2 extra virgin olive oil, 12 canola. I just do thi because I like the flavor and health benefits og Olive Oil but when I fry with it, the food tends to soak it all up and is more oily tasting. A personal preference. Once oil is hot reduce to medium (or low on gas stove) heat and cook approx 1-3 minutes on each side. Voila! A healthy, deep fried snack! lol We serve with ranch dressing . 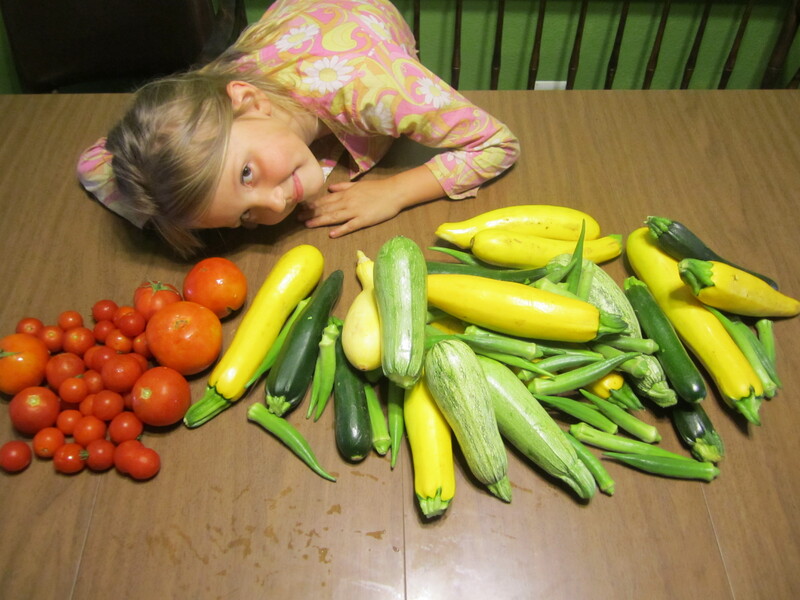 Zuccini, squash, tomatoes and okra! All fresh,organic, local, free. I hope one day our garden will feed our neighborhood and extended families ad friends. As a girly girl and a busy mom, I adore pampering myself when at all possible! I have been trying many new eco-friendly, organic, healthy products, such as Tarte to which I am utterly bedazzled by. 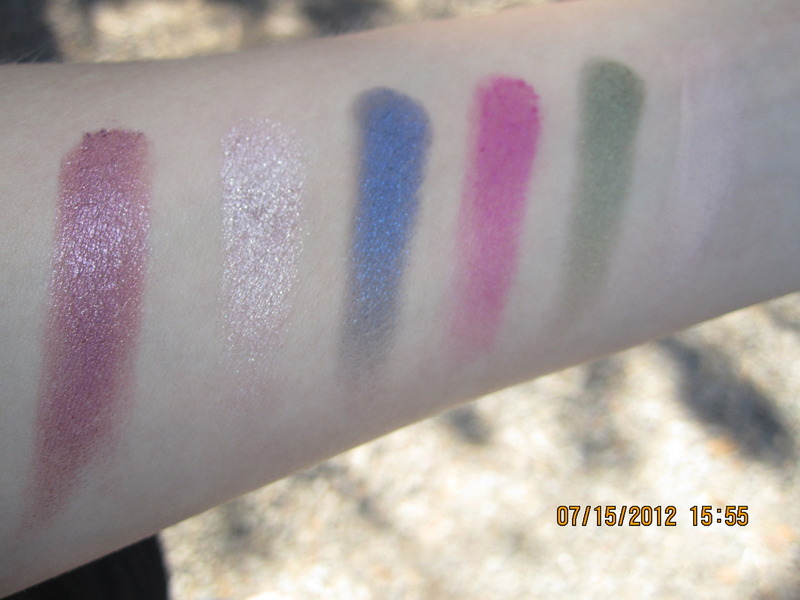 But I am not giving up on Urban Decay, their shadows have been a favorite of mine since middle school. 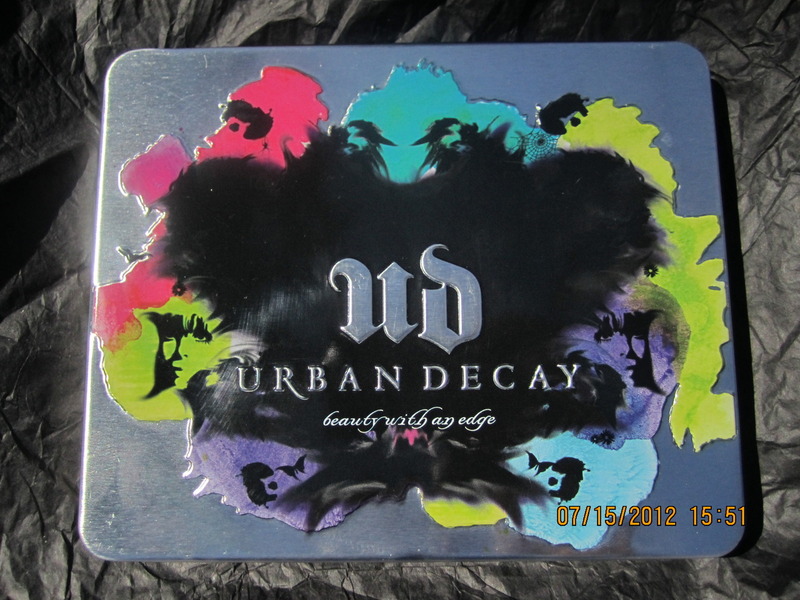 Many Urban Decay products are vegan, so that will be a plus to many of you. Lucky Magazine’s editor-in-cheif Holly Brandon was kind enough to have this sent to me and I have been playing with these shadows for a few days now. I am immediately smitten with the tin case that measure 5 1/2 x 4 1/2 inches. In my opinion it’s the perfect size. I like that it’s larger than traditional compact size but also not too bulky. I carry large purses and this could easily be thrown inside. The mirror is nice to have in this size as well. Last Call– warm-toned reddish plum with pink shimmer. 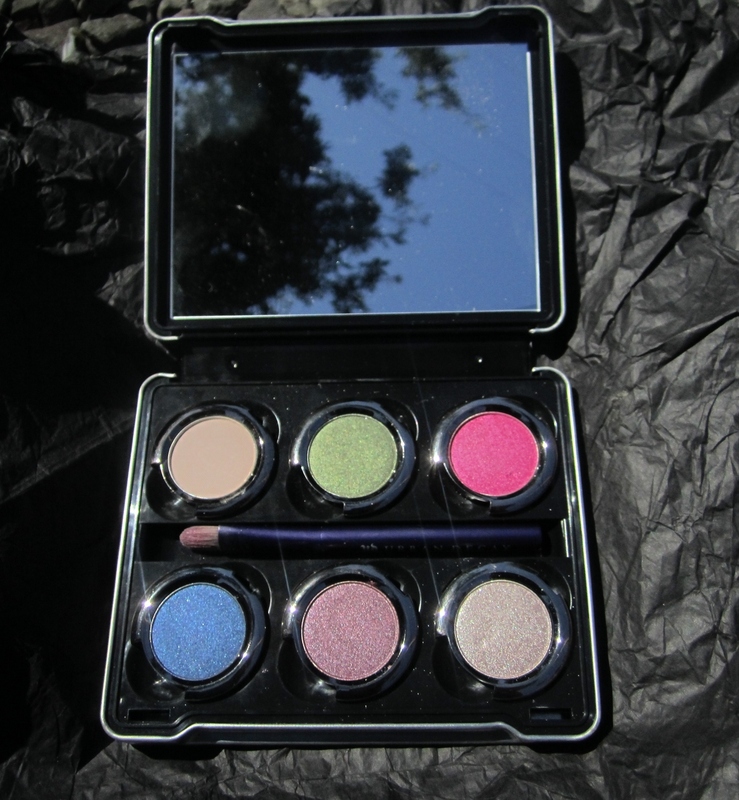 All of the shadows have a rich, velvety texture that glides on and a staying power that won’t disappoint. Last Call, Midnight Cowboy Rides Again, Evidence, and Mildew are all very high pigmented and it takes very little product. 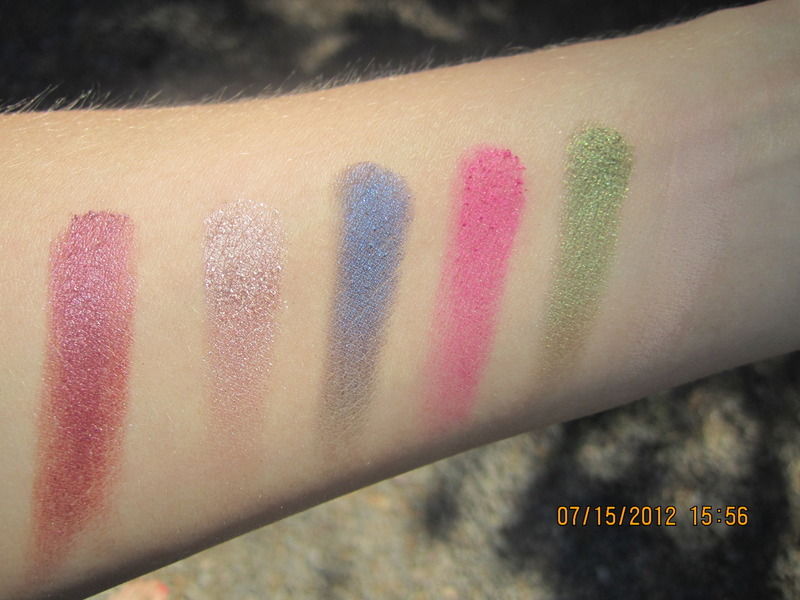 Where as, with the Woodstock I literally had to put 5-6 layers on my arm for the swatch so it would show up a vibrant color. The others it only took 2 quick strokes and the colors were striking. I am ok with Woodstock being a bit less pigmented because the color is so loud that it gives you the creative freedom to build the color if you want it a true, deep hot pink, or for a more subtle look, just a layer or 2 of color. Walk of Shame is a true vanilla matte color that compares to MAC Vanilla. I know a lot of people really like MAC’s Vanilla but I was disappointed with it because I have to work really hard to be able to tell if I have any on And I know that some may say “less is more” and the purpose of make up is to bring out your natural beauty and that is all fine but I like to use a highlighter on all over my lids, in the corners and underneath on top of my concealer to camouflage tired eyes or dark circles and MAC’s Vanilla just didn’t do it for me and Urban Decay didn’t do it for me either. As you can tell from the pictures, I am fair skinned and for darker skin tones Walk of Shame will stand out more and I think some will be happy with this shadow, it’s just not a go-to for me. Now lets get to the brush. It is a smooth brush that is exactly like my concealer brush for applying concealer with isn’t a powder. It is not bad for a brush that comes in a pallet. You know not to expect too much out of the brushes that aren’t purchased separately. This will not likely be your favorite, but it will get the job done in a pinch. All in all, I would rate this pallet a 9. I really love it, and I can’t wait for others to start enjoying it as well. If you would like to stay up to date on my upcoming beauty reviews (including but not limited to Tarte “Call of the Wild” Pallet, Tarte 12 Hr-Miracle Foundation, Dior Addict Lipgloss, REN skincare, and so much more) PLEASE. PLEASE Follow. I will be blogging my heart out and have so many great products to share with you. The more readers I have the sweepstakes will be on my blog, so you will have the chance to take home some of these amazing products. Spread the word. Julep Nail Beauty Subscription! Join for $.01 this month! I was very fortunate to have a lovely reader share this one with me, and so I want to pass it along to you! It’s not too late to join Julep for .01 cent!! If your not familiar, this is similar to Birchbox, Test Tube, Eco-Emi, Loose Button. Like these other beauty subscriptions you pay a monthly fee and receive a beauty box filled with delux sample and occasionally a full size. Instead of make up and skincare Julep is all things nails! All you have to do to take advantage of the next Julep box is follow this link http://julep.com/?r=22593429 where you will be prompted to fill out a quiz to find out what color best suits your personality! This only takes a minute to best match you to their products. My quiz results were BOMBSHELL! This will take your bill from 19.99 to 0.01!!! No strings. No contract. If you don’t love Julep just cancel before the next issue and you will never pay them more than a penny. You can also skip months, come and go, as often as you like. Like what I do with Netflix. I think you lovlies will enjoy this one, the retail of the box is 40.00, the regular price Julep charged is 20.00, but the price you will have to pay is a PENNY!! PLEASE! Let me know how you like Julep when your gift arrives, I am waiting anxiously for mine!! What are some ways your making extra money for the holidays?